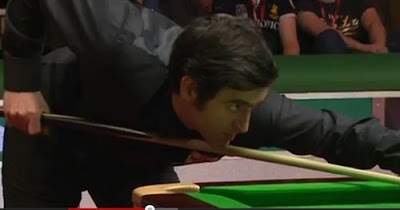 Welsh Open 2012: Ronnie O'Sullivan beaten Judd Trump by 5-3 to book a semi-finals place along with Shaun Murphy, Ding Junhui and Mark Selby. The clash between Ronnie and Judd are guarantee to be good matches and it is not an exception. Trump started off with a 109 but Ronnie replied with 101 and 88 to go 2-1 up, The Bristol man made 63 to level 2-2 at the interval. The Rocket regained the lead with 139 clearance before Trump knocked 88 to level once again. Judd had his chance to be ahead when Ronnie led 43-0 in the seventh frame but he threw it away. Ronnie won that scrappy frame and added 61 to claim a 5-3 victory. Ronnie said, "His breathing got a bit heavy, which I had not noticed before. Sometimes you just sense that your opponent is feeling it. That gave me the confidence to step up a gear. Maybe he felt a bit of extra pressure because he's been doing well lately so he was favourite. I still had to pot the balls, which is not easy.'' He added, "I'm under no pressure to be king of the jungle, the other younger players are trying to stamp their authority on the game. I can enjoy it more now." The Essex man will play Mark Selby, the world number one in the semi-finals. Maguire was hoping for a Berlin final rematch but he failed to force a decider when he lead 60-0 in front in the frame 8 but the lead did not put him in a winning position to force a decider, eventually lost the match by 3-5. Mark Selby had beaten Ronnie by 9-8 in the final here back in 2008. 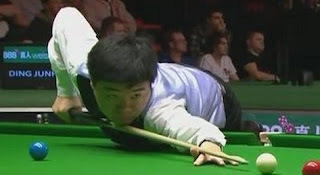 Shaun Murphy and Ding Junhui both won their deciders to set a clash in the semi-finals. Murphy looked cruised to win when he led 3-1 up on Mark Allen. The Northern Irish won the next three with runs of 121, 62 before Murphy held his nerve to force a decider with 68. Murphy was 70-0 up in the deciding frame but Allen gained two of the three snookers he needed. However, The Magician potted the brown to walk out as a winner, 5-4. China's Ding Junhui looked like he was out in the quarter-finals but a mobile phone ring at a vital moment of the decider, which Stephen Lee missed the green to let Ding clear up to win. "The phone went off just as I was on my back-swing and I couldn't stop," raged Lee. "That's the first time it has happened to me at such an important moment in all the years I've been playing. I am fuming. We both had plenty of chances in the last frame but we both played awful."